Local pickleball enthusiasts Rick Johnson and his son Isaac Johnson won the first-place gold medal in the men’s advanced 4.0 plus division at the Lake Havasu City Pickleball Tournament Feb. 28 in Lake Havasu, Ariz. The Boulder City Parks and Recreation Department offers opportunities to play pickleball as well as free clinics from 1-2 p.m. the second Saturday of each month in the Recreation Center gym, 900 Arizona St. The clinics are open to anyone 8 and older, but advanced registration is required by the Thursday before the clinic. Additionally, group play is scheduled from 9-11 a.m. Mondays and Wednesdays and from 1-3 p.m. Saturdays at the recreation center. Outdoor courts are available at ABC Park, 801 Adams Blvd. Equipment is available at the park’s fitness center as well as the recreation center. Local pickleball players are gearing up for several tournaments including the Henderson senior games April 15-17, Mesquite senior games April 27-29 and USA Pickleball Association western regionals in Las Vegas May 8-10. Boulder City High School’s rodeo team competed in the 22nd annual Boulder City Rodeo Feb. 28 and March 1. 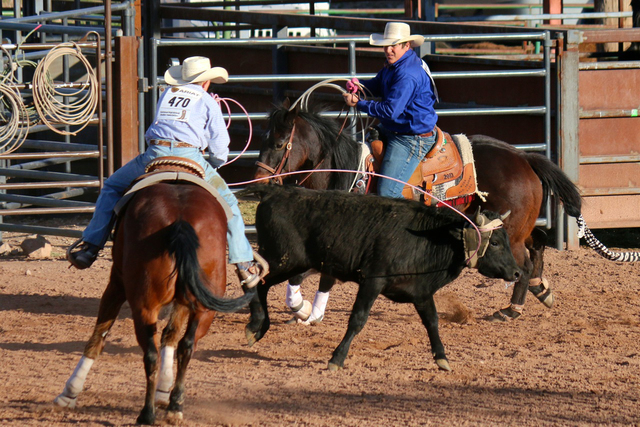 The full rodeo drew 135 contestants from across the state. Michael Lopan won first place in bull riding. Rachel Rohay placed fourth in pole bending and eighth in barrel racing. Jarad Sanford placed eighth in tie down. Around 700 runners are expected to race through Lake Mead National Recreation Area Sunday during the annual Six Tunnels to Hoover Dam St. Patrick’s Day run. The race includes a 1-mile stroll, 5K, half marathon and two-person relay run along River Mountains Loop and Historic Railroad trails. For more information, visit www.mountainmanevents.com/sixtunnels.htm. Boulder Dam Brewing Co. is presenting its first golf tournament May 28 at Boulder Creek Golf Club, 1501 Veterans Memorial Drive. The tournament is a 9-hole scramble and is set to tee off at 3:30 p.m. Proceeds from the tournament will benefit Boulder City United Methodist Fellowship. The tournament also is an ideal way for participants to network and socialize, said Kameron Hawkins, chairman and founder of Aranyi Cigars and the International Outdoors Chamber of Commerce, who is organizing the event. The cost is $50 per golfer or $180 for a foursome. The fee includes the tournament, golf cart and ticket for a beer and cigar at the after-tournament social at the Brewpub, which is set to begin at 5:30 p.m. There also will be an auction. Business sponsorships are available and include foursomes for the tournament. Additional information is available at www.aranyicigars.com or call Hawkins at 702-301-3663.